With Google Optimize you can test variants of web pages and see how they perform against an objective that you specify. Make sure you have Google Analytics installed using our integration. 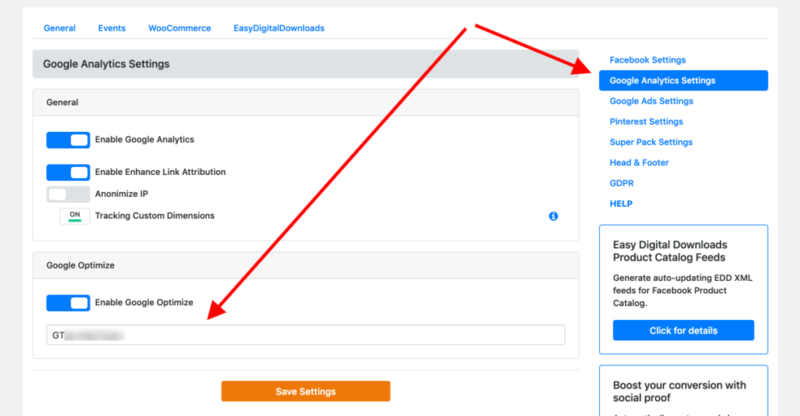 Open Google Analytics Settings from PixelYourSite Pro right-hand menu. Paste your container ID in the dedicated field and Save Settings. If you have a cache plugin, delete your cache. Both the container ID and the anti-flicker snippet will be added on all your website pages. You can register for free with Google Optimize here. The official Google support page is here. Google Optimize is supported by PixelYourSite Pro starting from version 7.1.0.